Last week’s event in Montgomery, Alabama exemplified the type of support and sportsmanship that makes the Scott Firefighter Combat Challenge all that it can be. Not only were the races exceptional, but the support was instrumental to the success of the event. With both the mayor and public services director in attendance all weekend, it’s easy to see how Montgomery was able to field 16 teams, and pull off a first-rate event! The city of Montgomery was named after the American Revolutionary War major general, Richard Montgomery- born in Ireland and first served in the British army. He lead the failed invasion of Canada and was killed after capturing Montreal. A battle of another sort took place in his city namesake this past weekend. 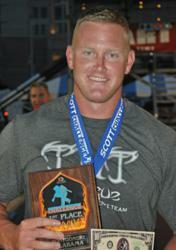 Our 368th Scott Firefighter Combat Challenge was an exceptional event. It is noteworthy for a lot of reasons. First, the temperature was 20°F cooler than last year- or at least it felt that way. Absent the torrential downpour that took out some of our electronic sound components, the weather was near spectacular. We were positioned on a virtually flat parking lot that was in good repair. The slight grade helped considerably in quickly removing the standing 2 inches of water that Mike Word and I observed from our relative place of safety, inside the Kentucky semi-trailer. On both of our competition days the colors were presented by the Montgomery Fire Department Honor Guard and the National Anthem was sung by Police Sergeant John Mackey and Police Officer Roderick Montgomery in a duet. This was one of the best renditions ever. I remarked that they should have tried out for American Idol- and we should have recorded them. The Mayor, Todd Strange made opening remarks and was around for all of the competition for both days, as was the Director of Public Safety, J. Christopher Murphy. That is, I believe a first. Here’s another first: Justin Beliveau of Hattiesburg (MS) took first place with a 1:39.82- a Lion’s Den criteria for his first time running in the Open category. That’s remarkable! The top 9 finishers were under 2:00. As expected, the Relays delivered the promised excitement. Sixteen teams from the Montgomery Fire Department were in the competition- representing almost every station as well as headquarters. The 25-member recruit class, all in their red PT gear reset the course with precision and harbor ominous forebodings of great things to come for the Montgomery Fire Department. Tuscaloosa, Hattiesburg, Pearl, Seymour Johnson AFB and of course Montgomery Fire Department made a great contest of the final eliminations with a run only 5 seconds off the World Record. I characterized this event as near perfect in every category and an exemplar of what we’d like to see at every regional. Kudos to Chief Milford Jordan and his staff. We’re already looking forward to a return engagement in Montgomery next year.